In my last few posts I have really stressed how important it is to use simple strategies to make sure your morning is calm, organized and runs like a well oiled machine. When we do this and the morning does go well, we are more likely to eat healthier, spend stress-free time with our children, feel confident and relaxed and be more effective throughout the day. We also send our children off into the world with positive feelings of their own. We can leave behind the crazy, chaotic mornings of the past and can look forward to a healthier more positive morning. There are exceptions to every rule but in general you can expect your morning and the rest of the day to go pretty well if you set yourself up the night before and help your kiddos prepare to have smooth and positive morning. After catching up for a bit, Tee and I began talking about what to prioritize in the morning for ourselves as busy moms and for our kids. Although I know I have a flexible list living inside my head, Tee suggested that this list of morning priorities should be a physical list that could be referenced by every member of the family. So after a trip to the craft store for a black canvas and permanent chalk markers, Tee created this gorgeous masterpiece that has been a true compliment not only to our kitchen decor but also to our morning routine. I believe what makes this addition so significant is how beautiful it is, but I mean that in more than one way. Aesthetically, of course. But even more than that, it creates a connection to our routine and reinforces the feeling that our morning rituals are a sacred part of our day. They are a cherished part of who we are. This is where things go from being a healthy habit that you go through the motions of each day to a rich part of a mindful and healthy lifestyle. 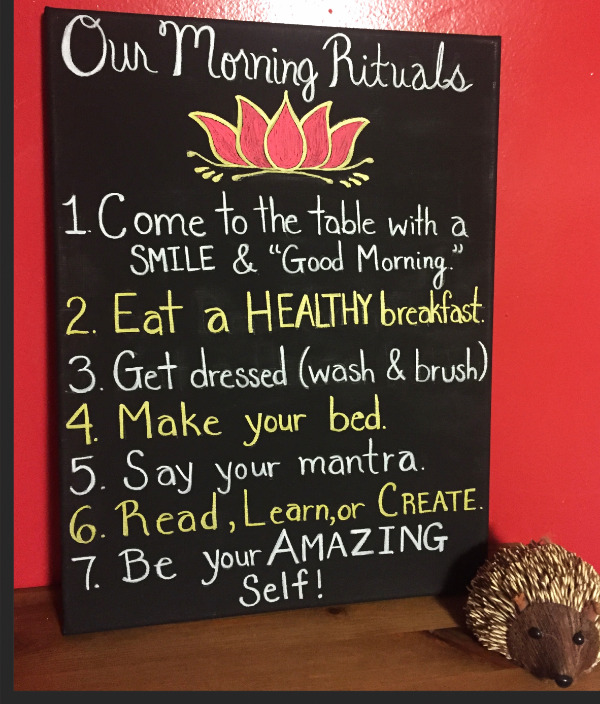 So what are the morning rituals we have in our home? Well, I am glad you asked. 1. Come to the table with a SMILE and "Good Morning". Everything is energy. I really believe that whatever energy you put out there is coming right back at'cha. So why not start the day smiling and with a good helping of positive vibes? When you start the day with a healthy breakfast you are ready for whatever else the day may bring you. Energy, focus, and more are yours when you eat a healthy, whole food meal to start your day. 3. Get dressed (wash & brush). These are a couple of tasks that are usually staggered here in the morning. One kiddo is brushing their teeth, one may be getting dressed, another finishing up breakfast. As long as we keep it moving, everything can get done in a timely manner. Such a simple way for children to learn responsibility. My kids do sometimes get assigned a few other tasks in the morning, but this is a constant. I have a mantra I am always working with and so do my kids. We usually work with one mantra all week long. "I am powerful," "I make the world a better place," "I can choose to be happy." These are some examples of mantras we might have for the week. 6. Read, Learn or Create. Once breakfast, getting dressed and simple chores are done, I aim for the kids to have time to quietly read, play a math game or draw, as a few examples of how we might use this time. There is no TV in the morning and tech devices are used for learning games only. This really keeps everyone feeling calm and positive before school. 7. Be your amazing self. I can't thank Tee enough for taking these seemingly simple pieces of our morning and putting them together in a way that helps us see how much value they hold for us. Not only do I have a beautiful addition to my kitchen decor, it is an addition that is meaningful to our family. I am so lucky that I was able to work with Tee on this post. I would love you guys to learn more about her and the magic that she creates. For inspiration and tips on home decor and DIY projects, please sign up for Beauteeful Living's newsletter here . Be on the lookout for a special e-book coming out this spring. I know Tee so I know her book will be amazing. Inspired to create a beautiful homemade project like this one? Here are some materials similar to the ones used here. You can check out these and many others on Amazon.